Joel Richardson has a mixed background and reputation in prophetic circles. This 2009 book has created a lot of interest because it is Richardson’s thesis that the antichrist is Islamic, not “Christian.” (See my article in this issue for a refutation of that view) In trying to look up Richardson’s background and connections I found that he has often appeared with and written for Glenn Beck, even claiming that God has given him divine revelation concerning his Scriptural insight. Some have claimed that this is not his real name but a pen name for matters of security. He evidently holds a mid or pre-wrath view of the rapture. In the book he often describes Christians in the tribulation (p. 180, 184). He has written for and with Walid Shoebat who appears on conservative news channels as an Islamic expert. However, Shoebat has his own problems, professing to be a former terrorist, which was questioned by the Jerusalem Post (3/30/08) and others. 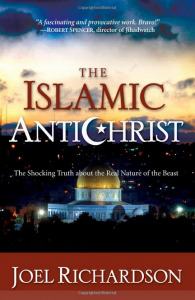 While this book does give a lot of good information concerning Islam and its beliefs, Richardson’s main thesis is that we have not understood the prophecies of the antichrist correctly. He believes that the antichrist will actually be the Islamic Mahdi (the Muslim Messiah) and that the false prophet will turn out to be a man claiming to be the Muslim Jesus—a man who denounces Christianity and turns the world to Islam. Richardson believes that the ten nation federation of the antichrist is identical with the Islamic nations mentioned in Ezekiel 38 and therefore there will be no “Revived Roman Empire” but rather a “Revived Islamic Empire.” Richardson is so convinced of Islam’s advances in the last few years that he sees no other alternative than to believe that Islam will shortly rule the world through the (false) Mahdi. Though I learned a lot of interesting facts and details about Islam, I have to recommend this book with caution due to Richardson’s unseemly connections and especially his claim to revelation.